First Ferry's triple-deck Ordinary Ferry "Xin Guo" turns into Cheung Chau Harbour with Chi Ma Wan peninsula of Lantau Island in the background. 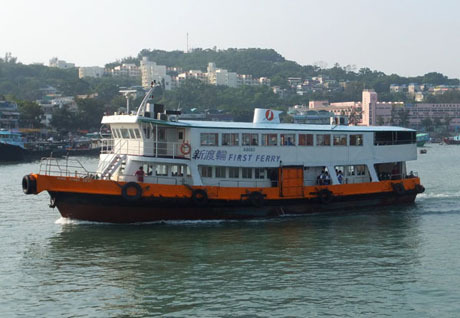 Scheduled ferry services to outlying islands Cheung Chau, Lamma, Lantau, Peng Chau and Ma Wan operate from Central Ferry Piers on Hong Kong Island. 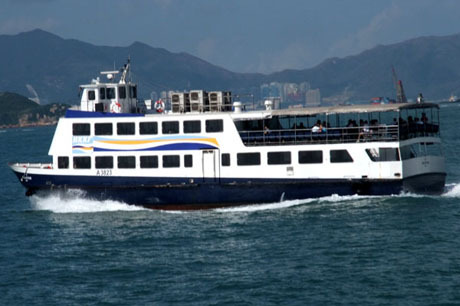 Additionally, an inter-island ferry service connects Cheung Chau, Lantau (Chi Ma Wan and Mui Wo) and Peng Chau. 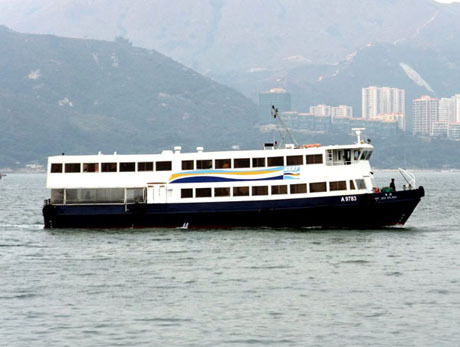 Ferry services from Aberdeen also serve Lamma Island and Ma Wan (Park Island) is also served by ferries from Tsuen Wan. About 41,000 islanders in addition to tourists are dependent on these ferry services. 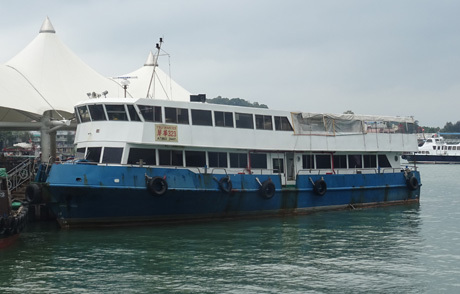 A re-tendering process by the government in 2008 resulted in new operating licences being awarded for the outlying islands ferry services to Cheung Chau, Lantau (Mui Wo), Lamma and Peng Chau for a period of three years from 1st July 2008. The new licences resulted in new operating companies for the Central - Peng Chau route and Central to Lamma (Yung Shue Wan and Sok Kwu Wan) routes. 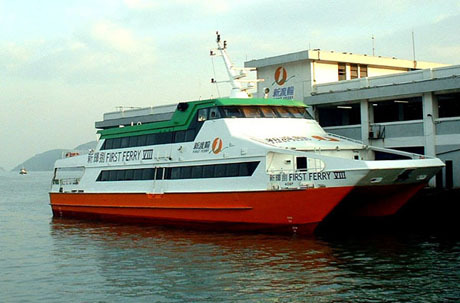 Services to Peng Chau, previously operated by New World First Ferry (NWFF) are now operated by HKKF, whilst services to Lamma are operated by Islands Ferry Company Limited (Yung Shue Wan route) and Winnertex Limited (Sok Kwu Wan route), both these companies being subsidiaries of Hong Kong & Kowloon Ferry Holdings (HKKF). 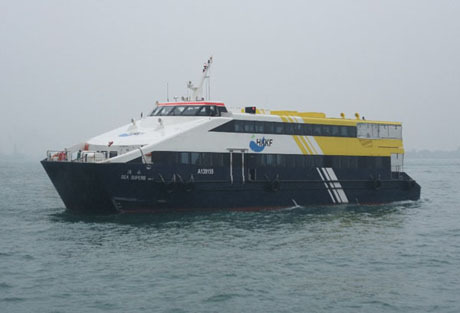 Services to Cheung Chau, Lantau (Mui Wo) and the Inter-Island ferry service continue to be operated by NWFF. In March 2011, following submission of tenders, the Transport Department confirmed three-year licences were awarded to the existing operators of the routes Central - Mui Wo (from 1 April 2011), Central - Cheung Chau, Central - Peng Chau, Central - Yung Shue Wan, Central - Sok Kwu Wan and the Inter-Island service (from 1st July 2011). 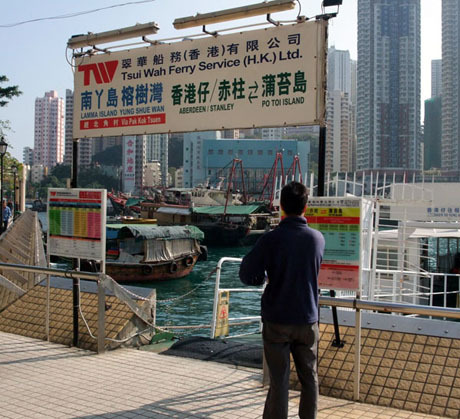 The government is providing up to HK$120 million of public funds during the licence period to reduce the level of fare increases to the public and assist ferry operators with the cost in maintaining a viable service to these islands. The government has also announced its intention to carry out a full review of the outlying ferry services with a view to enhancing the long term financial viability of these services and maintaining fare stability. At the time of announcement of the review only the Central - Cheung Chau route is profitable and the government has proposed special helping measure assistance to operators by waiving pier rentals and some other expenses and building an additional tier to each of Central Ferry Piers to enable operators to generate additional income from renting out shops, restaurants and space for exhibitions. In February 2014 the Transport Department agreed to extend the existing operators licenses for a further three years. Fares rose by about 5% on the Central - Mui Wo route from April 2014 and between about 5% and 6.2% on other routes from July 2014. The government subsidy for the three year period will be HK$190 million, an increase of HK$40 million over the previous three years. In June 2016 First Ferry became the first public transport operator to provide breastfeeding facilities when it installed a HK$150,000 nursing room on one of its triple-deck ferries serving the outlying islands. The 4.6 metre room can cater for two mothers and is equipped with air-conditioning, sofa, diaper pad, wash basin, hand dryer and emergency bell. The room is situated on the deluxe deck but passengers in ordinary class can use the room by notifying crew members. The company plans to install breastfeeding rooms on three other Ordinary Ferries. However, the Fast Ferries are considered too small to accommodate this facility. First Ferry is also investigating the possibility of installing breastfeeding rooms at piers. New World First Ferry and HKKF agreed to reduce fares on their outlying islands and inter-islands routes between 2nd July 2016 and 31st December 2016 following substantially lower fuel prices leading to increased profits on these subsidised routes. Reductions for a single trip range from about HK$5.5 to HK$1.4 for adults and HK$1.6 to HK$0.7 for children. Fare increases, averaging about 4%, take effect on the Central - Mui Wo route from 1st April 2017 and on the Central - Cheung Chau, Peng Chau, Yung Shue Wan, Sok Kwu Wan routes and the Inter-Island service from 1st July 2017. In November 2016 the Transport Advisory Committee agreed to support proposals to extend the licence of the six major outlying island ferry routes for three years, including enhanced Special Helping Measures (SHM) for the next licence period from mid-2017 to mid-2020. Under the proposals the upward cap of the SHM subsidy will be increased to HK$410 million in order to maintain the financial viability of the ferry services and alleviate the burden of fare increase on passengers. Committee also confirmed its support for the Government's proposed addition of a new item, to reimburse half of the depreciation expense associated with the introduction of new vessels or improvement of services, facilities or equipment. An average fare increase of about 4% for the six routes will take effect on commencement of the new licence period. The profit-sharing mechanism established during the mid-term review of the current licence period (mid-2014 to mid-2017) will be applicable to the next licence period, where operators will share "windfall profit" with passengers on a 50:50 basis through offering fare concessions. The effectiveness of the new arrangements and consideration of the most effective long-term operating model is to be considered in the next mid-term review in the first half of 2019 and whether that model should also be applicable to the eight other outlying island ferry routes, other than the six major outlying island ferry routes. In June 2018 legislation was passed extending the maximum period of operation of a licence from three to five years with the maximum aggregate licence period remaining at ten years. Fare payment can be made in cash at the ticket kiosks at each pier or by Octopus Card which can be purchased from the ticket kiosk at the ferry pier. Ferry services are punctual and reliable and the departure time shown in timetables is the time the pier gate closes. The service is operated by “First Ferry” (New World First Ferry Services Limited). There are both “Fast Ferry” and “Ordinary Ferry” services. Catamarans used for the Fast Ferry service have a capacity of up to 400, depending on type of boat. “Fast Ferries” are catamarans which reduce the journey time by 20 minutes. These have sealed windows, often with poor visibility. The Ordinary Ferry service uses mainly triple-deck ferries with a capacity of about 1500 although double-deck boats with a smaller capacity (about 600) may be used on some services. The Ordinary Ferry service provides much more of a cruise experience. Passengers are free to move around the ship and all “ordinary” ferries have a “deluxe class” deck with air conditioning, more spacious seating, tables, TV screens and an open outdoor sundeck. Ordinary ferries also have vending machines (operated by Octopus Card only) offering a range of drinks and snacks. Smoking is not allowed on any of the services (including on open decks). On many boats used on the Cheung Chau service the middle deck (ordinary class) of these triple-deck ferries has a back row of stern-facing seats sheltered by a canopy which on days of strong sunshine can be more comfortable then the exposed sun deck in de-luxe class. There are separate Octopus entry turnstiles for Ordinary Class and Deluxe class on entry to the pier. A previous facility to upgrade to Deluxe Class using Octopus Card once on board until 10 minutes after departure was withdrawn in August 2014. The Cheung Chau route is a busy service, used by commuters as well as visitors and at peak times (about 5pm to 9pm) on weekdays the Fast Ferry service can become full. Standing on the Fast Ferry is not allowed and visitors are advised to arrive at the pier turnstiles at least five minutes before departure time if intending to take the Fast Ferry during peak times. Once full, the Fast Ferry departs (without waiting for scheduled departure time). Ferries operate at approximately 30 minute intervals during the daytime alternating between Fast Ferry and Ordinary Ferry until about midnight with additional peak time services. Overnight, there are three Fast Ferry departures from Central and two from Cheung Chau between midnight and 6am. Monday to Saturday - ADULT - HK$26.8 - Sundays and public holidays HK$38.8. CONCESSIONS - Child (3-12), Senior (65+) and holders of Registration Card for disabled persons Monday to Saturday - HK$13.4 - Sundays and public holidays HK$19.4. ORDINARY CLASS - Monday to Saturday ADULT - HK$13.6 - Sundays and public holidays HK$20.2. CONCESSIONS - Child (3-12), Senior (65+) and holders of Registration Card for disabled persons Monday to Saturday HK$6.8, Sundays and public holidays HK$10.1. DE-LUXE CLASS - Monday to Saturday ADULT HK$21.3 - Sundays and public holidays HK$31. CONCESSIONS - Child (3-12), Senior (65+) and holders of Registration Card for disabled persons Monday to Saturday - HK10.7, Sundays and public holidays HK$15.5. The above fares do not include the concessionary fare of the HKSAR Government’s “Public Transport Fare Concession Scheme for the Elderly and Eligible Persons with Disabilities” under which eligible persons can travel in Ordinary Class at a fare of HK$2 per journey (or 50% of normal adult fare, whichever is lower) when using Elder Octopus Card (Elderly Persons) or Personalised Octopus Card with Persons with Disabilities Status. Foreign elderly persons age 65 and over are able to benefit from this concession when using Elder Octopus Card. New service introduced in August 2015 and operated by Maris Ferry Service Limited. There are seven sailings each way on weekdays and twelve sailings each way on weekends and public holidays. The service operates from Aberdeen Ferry Pier on Promenade and from Cheung Chau Public Pier (adjacent to the main ferry pier). From Aberdeen Promenade ferry services also operate to Yung Shue Wan, Pak Kok Tsuen, Mo Tat and Sok Kwu Wan on Lamma Island. 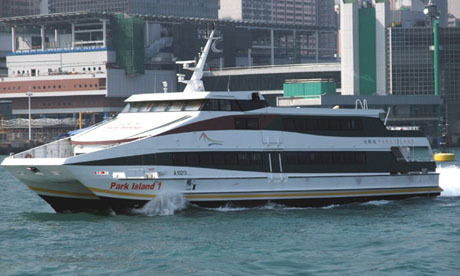 A shuttle ferry service operates across Aberdeen Harbour between Aberdeen Promenade and Ap Lei Chau and a free shuttle operates from Aberdeen Promenade to Jumbo Kingdom floating restaurants. An infrequent ferry service also operates on certain days between Aberdeen Promenade, Stanley and Po Toi Island. 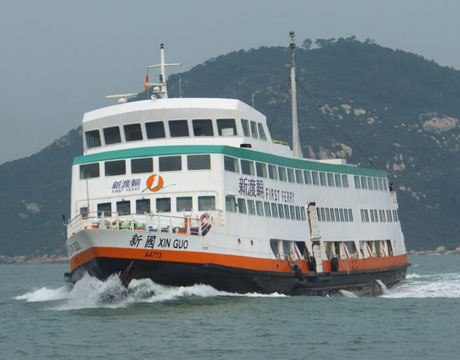 From Cheung Chau ferry services operate to Central Pier 5 on Hong Kong Island and an Inter-Island ferry links Cheung Chau with Chi Ma Wan and Mui Wo on Lantau Island and Peng Chau. From 24th December 2016 the timetable has been revised and includes an additional daily sailing on weekdays from Aberdeen and Cheung Chau. FARE - HK$30 on weekdays, HK$32 on weekends and public holidays. Child under 3 free. Fare can be paid using Octopus Card or cash. The above fares do not include the concessionary fare of the HKSAR Government’s “Public Transport Fare Concession Scheme for the Elderly and Eligible Persons with Disabilities” under which eligible persons can travel at a fare of HK$2 per journey (or 50% of normal adult fare, whichever is lower) when using Elder Octopus Card (Elderly Persons) or Personalised Octopus Card with Persons with Disabilities Status. Foreign elderly persons age 65 and over are able to benefit from this concession when using Elder Octopus Card. The service is operated by “First Ferry” (New World First Ferry Services Limited). The Fast Ferry service is operated by catamarans with a capacity of between 230 and 400 passengers and the Ordinary Ferry service utilises double-deck boats with a capacity of between 500 and 600 and occasionally triple-deck ferries with a capacity of about 1500. Some Ordinary Ferry services have two accommodation classes, Ordinary Class and Deluxe Class. Deluxe Class has an air-conditioned cabin, depending on boat, sometimes an outside sun deck. Passengers can choose between Ordinary Class and Deluxe Class (when available) at the pier entrance. A previous facility allowing passengers to upgrade to Deluxe Class using Octopus Card once on board was withdrawn in August 2014. The pier at Mui Wo, also known as Silvermine Bay Ferry Pier, is located adjacent to Mui Wo Bus Terminus where passengers can connect to bus services for Ngong Ping, Tai O and Tung Chung. Ferries operate at approximately 40-minute frequency until 11-30pm mostly alternating between Fast Ferry and Ordinary Ferry but with additional sailings at peak times. 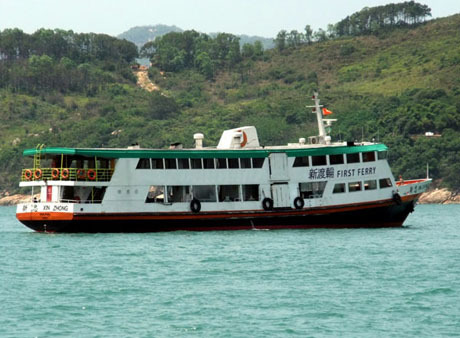 Between midnight and 6am there are Fast Ferry services from Central at 00-30 and 3am and from Mui Wo at 3-40am. This is a 24-hour service operated by Discovery Bay Transporation Services Ltd which has a monopoly on transport to and from Discovery Bay which is a private development. 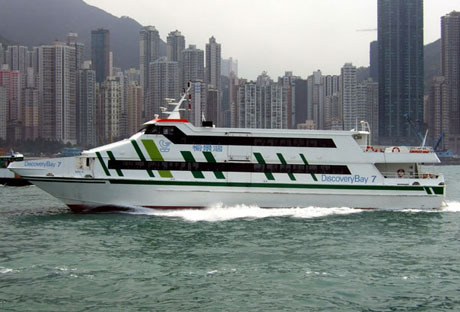 Average daily patronage of the Central - Discovery Bay ferry service during 2012 was 11,648. Fast air-conditioned catamarans operate a frequent service at approx 15-30 minute intervals from 6-30am until 00-30 then at 30-90 minute intervals until 6am. Most ferries have an outside uncovered section at the rear of the upper deck. A night surcharge applies to fares for journeys after midnight and before 6am. Discovery Bay is a modern western-style private residential development, popular with commuters to Hong Kong’s financial district in Central. It has an artificial beach and visitors can explore scenic trails in the area including a popular trail to Mui Wo via the Trappist Monastery. From Discovery Bay there are frequent bus connections to the airport, Tung Chung and Sunny Bay MTR Station and from Nim Shue Wan pier, about 10 minutes walk from Discovery Bay Ferry Pier in the next bay there are kaido services to Peng Chau, Trappist Monastery and Mui Wo (Silvermine Bay). The service is operated by HKKF. Both catamarans (with a capacity of about 200 passengers) and monohull boats (with a capacity of between 180 and about 300 passengers) are used for the Fast Ferry service and monohull only boats with a capacity of about 300 are used for the Ordinary Ferry service. All monohull boats are double-deck and some have a sun deck. Ferries operate at approximately 60/90 minute frequency from 6-10am until 11-30pm and there are night sailings at 00-30 and 3am from Central and 3-40am from Peng Chau. ADULT – HK$29.6, Monday to Saturday, *HK43.5 Sundays and public holidays. CONCESSIONS - Child (3-12), Senior (65+) and holders of Registration Card for disabled persons Monday to Saturday HK$14.8, Sundays and public holidays HK$21.8. ADULT – HK$15.9, Monday to Saturday, HK$22.8, Sundays and public holidays. CONCESSIONS - Child (3-12), Senior (65+) and holders of Registration Card for disabled persons Monday to Saturday HK$8, Sundays and public holidays HK$11.4. 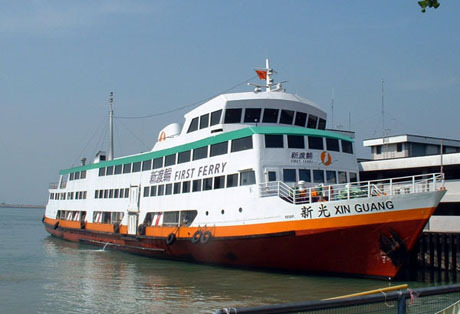 First Ferry operate the Inter-Island ferry service which links Cheung Chau, Chi Ma Wan and Mui Wo on Lantau and Peng Chau. The service operates from 6am until midnight and utilises a double-deck boat with a capacity of about 350 passengers. There is no service to Chi Ma Wan after 8-30pm and not all daytime services call at Chi Ma Wan. Cheung Chau* > Chi Ma Wan 20 mins, Chi Ma Wan > Mui Wo* 20 mins, Mui Wo > Peng Chau 25 mins, Peng Chau > Mui Wo 25 mins, Mui Wo* > Chi Ma Wan 20 mins, Chi Ma Wan > Cheung Chau* 20 mins. * On services which do not call at Chi Ma Wan, the journey time between Cheung Chau and Mui Wo is reduced to 25 mins. ADULT – HK$13.4, CONCESSIONS - Child (3-12), Senior (65+) and holders of Registration Card for disabled persons HK$6.7. 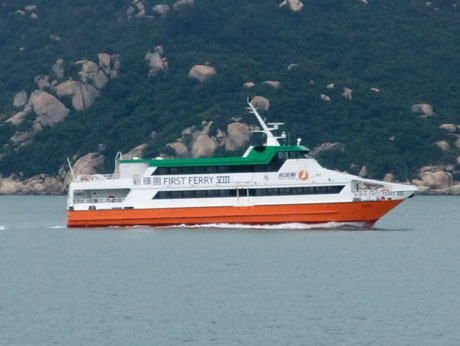 The service is operated by Islands Ferry Company Limited, a subsidiary of HKKF. On Mondays to Fridays sailings operate from 6-30am until 00-30 at approx 45-90 minute intervals but with additional peak hour journeys. On Sundays and public holidays the frequency increases to half-hourly. The service uses both catamarans (mainly on peak hour sailings) with a capacity of about 200 passengers and monohull vessels with a capacity of 170 to 480. On some monohull vessels there is a sun deck. Yung Shue Wan is the main village on Lamma. It is also served by ferries from Aberdeen (see details below). The island has another ferry pier at Sok Kwu Wan and visitors can land at Yung Shue Wan and follow the popular trail to Sok Kwu Wan then return to Central from Sok Kwu Wan. JOURNEY TIME – 25-30 minutes (depending on type of craft). ADULT – Monday to Saturday HK$17.8, Sundays and public holidays HK$24.7. CONCESSIONS - Child (3-12), Senior (65+) and holders of Registration Card for disabled persons Monday to Saturday HK$8.9, Sundays and public holidays HK$12.4. The service is operated by Winnertex Ltd, a subsidiary of HKKF. Services operate at approx 90-minute to two-hourly frequency on Mondays to Saturdays until 11-30pm. On Sundays and public holidays there are five additional sailings which are optional, according to demand. The service mainly uses monohull vessels with a capacity of up to about 200. Sok Kwu Wan is also served by a kaito ferry service from Aberdeen via Mo Tat on Lamma (see details below). ADULT – Monday to Saturday HK$22, Sundays and public holidays HK$31 CONCESSIONS - Child (3-12), Senior (65+) and holders of Registration Card for disabled persons Monday to Saturday HK$11, Sundays and public holidays HK$15.5. 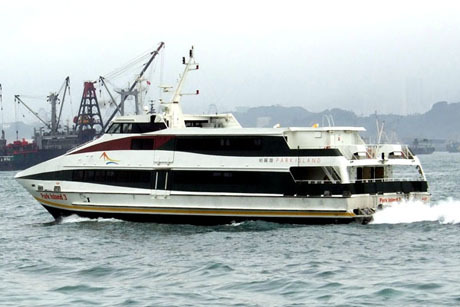 The service is operated by Tsui Wah Ferry Service (HK) Limited. 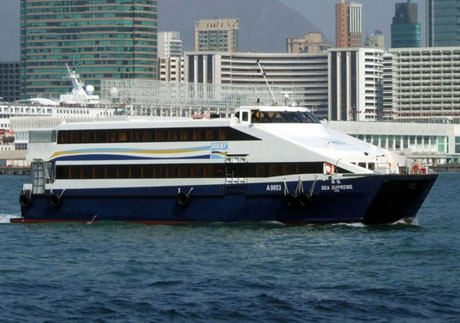 There are 10 daily return sailings (11 on Sundays and public holidays) from Aberdeen, each calling at Pak Kok Tsuen “en route” to Yung Shue Wan. The service uses a small monohull double-deck craft with a capacity of about 200. ADULT – HK$19*. CONCESSIONS - Child (1-12), Senior (65+) and holders of Registration Card for disabled persons HK$9.5*. ADULT – HK$21*. CONCESSIONS - Child (1-12), Senior (65+) and holders of Registration Card for disabled persons HK$10.5*. 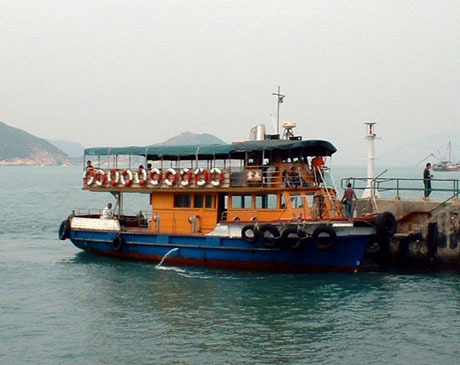 The service is operated by Chuen Kee Ferry Limited and uses two double-deck kaitos with a capacity ranging from about 140 to 150. There are 13 daily sailings from Aberdeen with an additional two sailings on Sundays and public holidays. Passengers can disembark on Lamma at either Mo Tat, north of Sok Kwu Wan where there is a beach and restaurants or at Sok Kwu Wan, Lamma’s second largest village which is renowned for its seafood restaurants. ADULT – Monday to Saturday** HK$12 (*HK$4.6), Sundays and public holidays HK$18 (*HK$6). CONCESSIONS - Child (3-12) and holders of Registration Card for disabled persons Monday to Saturday HK$6 (*HK$2.2). Sundays and public holidays HK$9 (*HK$3). Seniors (65+) Monday to Saturday HK$9 (*HK$4.6), Sundays and public holidays HK$18 (*HK$6). Park Island is a private residential development on the small island of Ma Wan which is located under the western end of the Tsing Ma Bridge and is also the location of Noah’s Ark and Ma Wan Park. The boats are fast air-conditioned double-deck catamarans. Ferries operate at intervals of approx 15 to 30 minutes from 7am until 11pm but from midnight until 7am ferry services are replaced by bus services. The service is operated by Park Island Transport Company Limited. Park Island is a private residential development on the small island of Ma Wan which is located under the western end of the Tsing Ma Bridge and is also the location of Noah’s Ark and Ma Wan Park. The boats are fast air-conditioned double-deck catamarans. Tsuen Wan Ferry Pier is located within 2 minutes walk of Tsuen Wan West MTR Station. A frequent service previously operated between Park Island and Tsuen Wan but was withdrawn in December 2012 owing to lack of demand and heavy losses sustained by the operator. However, a limited service of three daily sailings each way was reinstated from 8th June 2013.